Welcome to our page of bed and breakfast in Brixham! Brixham has two main industries - fishing and tourism. 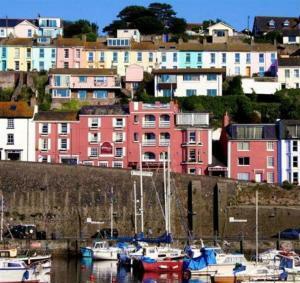 Brixham is picturesque, with quaint and olde-worlde cottages and harbourside, which nestles at the foot of the town. The harbour is the focal point of Brixham. where you can buy a wide variety of fresh fish. Brixham has several beaches, and a free saltwater outdoor swimming pool, right by the edge of the sea, supervised by lifeguards.If you are in the right town but cannot find the accommodation you want on this page, you might consider Brixham hotels & self catering accommodation in Brixham. Also see Brixham & Brixham attractions. For bed and breakfast accommodation in other areas near to Brixham Devon see Bed and breakfast in Torquay & Bed and breakfast in Paignton.